John Colpitts is a prolific and skilled percussionist based in New York City. Also known as Kid Millions, he’s a founding member of the Brooklyn-based band Oneida who are acclaimed for their euphoric, propulsive, and open-ended rock sound. Over the past four years, Colpitts has been exploring the outer limits of drums under the moniker Man Forever, which often finds him working with notable musicians, starting improvised drum kit circles, and touring the world. His latest release is a collaboration with New York ensemble So Percussion. It’s called Ryonen, it’s out now via Thrill Jockey Records, and has prompted Man Forever to tour different parts of the world, including China, where he has a few shows this week. 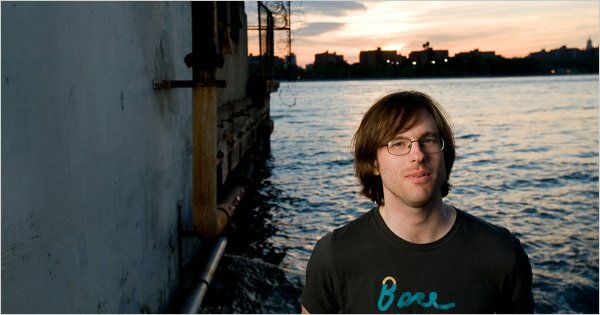 Here, John and I discuss living in the distinctive area that is Queens New York, Ramones, Ryonen and Wordless Music and connecting with So Percussion, going beyond indie-rock, the two Ryonen tracks “The Clear Realization” and “Ryonen” and why he doesn’t remember what the lyrics are for the former, meditating on detachment, the sky above and drones and surveyors, humans not martians, the utterance of words in relation to the music being played, the thing is the thing, meditation parallels, distractions and drummers getting into the zone, Ryonen the naked girl and the disturbing Zen kōan about Ryonen, the relationship between Zen Buddhism and psychedelia, Music for Children, piano lessons with a terrible teacher, scales, dropping music, listening to Top 40 music until college, damn dirty hippies, how Oneida came to be in Brooklyn, the band Mongrel, Oneida never broke up, I keep missing John in Ontario, where Man Forever came from, Lou Reed’s Metal Machine Music, Ulrich Krieger, playing with Yo La Tengo on TV, working with Jim Sauter of pioneering noise band Borbetomagus, playing with the Boredoms in Japan, Oneida is making an album with Rhys Chatham and one of their own too, a People of the North EP called Judge a Man by His Fruits, the record John is making with Bry Webb, the song “The Clear Realization,” and nothing more.